The exhibition is open Fri-Sun at 12pm-4pm. The 13th century is part of what is often referred to as the dark Middle Ages – a period connected with war, plague and early witch persecution. By then, the Catholic Church formulated the first scriptures on why witches should be burned, something that would be executed for a few centuries ahead in Europe. 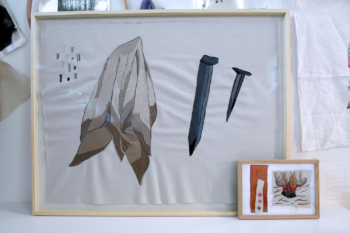 The artist Åsa Norman has looked at a couple of women’s strategies to create space for working and living free from men’s control during this period. In the exhibition, the benin Mechthild von Magdeburg, the vicarage of Katarina of Vadstena and the nuns Katta and Dilla, meet, who, according to the tale, christened Sormland. In a multi-material installation with embroidery, applications and an 8x8m large drapery, the artist plays with the idea of ​​the progressive movements and places that were shaped as resistance to the harsh social climate. Here something points towards our own time, and the darkness that often comes to describe it. But if we move our gaze over history, nothing seems to be forever, and the light flows into the exhibition space.